At 7pm sharp, the meeting was called to order by club president Seleucus. 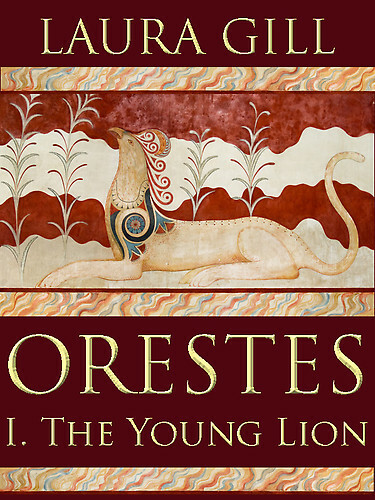 Members were asked if they had copies of Orestes: The Young Lion. Amyntas of Pella and Amyntas of Aegae didn’t, so were voted by a show of hands to be tonight’s designated drivers. Amyntas of Pella sulked. It is traditional for the club president to give a short biographical account of the author before discussion of their book begins. “Unfortunately,” he said, standing up, “I know rather sod all about Miss Gill. She maybe a Mrs or even a Ms as she is American but who knows?”. Seleucus asked for the words ‘sod all’ to be replaced by ‘very little’ in the minutes but this request was shouted down. In lieu of any known facts (other than those presented at the back of the book) about the author, Seleucus gave way to Meleager who exercised his right as the chooser of the book to explain his reasons for doing so. “I have always been fascinated by the story of Orestes,” he said, “Or rather, Orestes in relation to his big sister, Elektra. It probably comes from having a big sister myself – one who wasn’t afraid to put me in my place when need be.” he added, rubbing his arm, meaningfully. Murmurs of sympathy went round the room, and several pipes were lit. Meleager sat down and the floor was declared open. A brief discussion on Gill’s protrayal of Clytaemnestra and Aegisthus followed and it was agreed that she makes very good use of the limited space that she gives herself at the start of the book (22 pages cover the first five chapters). When the discussion began to degenerate into an analysis of ancient Greek sexual mores, Seleucus called the meeting to order. An unknown member then muttered he wouldn’t put it past the Government to announce such a thing as part of its austerity measures (“Fewer children, more money for the rest of us”). Red Amyntas demanded that this be put to a vote and the motion ‘We believe that David Cameron would sacrifice children to repair the British economy’ was passed by a majority vote. It is believed* (*hoped) that all members except Red Amyntas voted ironically or at least under the influence of wine. Perdiccas’ comment received much laughter, and he was declared a good show by all-and-sundry. The wine carafe was passed round the room and several pipes were relit. Harpalus “What I really want to know is – are the gods going to turn up later on? I really, really want them, to do so! Artemis is referred to in a way that suggests she is real but we don’t see the Olympians at the beginning. I need for this book to extinguish the memory of Troy in my mind. Harpalus was immediately called up on his use of the phrase ‘need for’; he agreed that it was a reprehensible Americanism and apologised before a vote could be taken to make him the next meeting’s designated driver. The meeting continued. This question was put to the Club and no one knew so the meeting continued. It was then discovered that the word ‘oily’ appears in Chapter Six so we should not have even been talking about it. Votes were taken on the Word and Scene of the Night and passed, as above. The formal discussion ended and the informal discussion (unminuted) began. Olive oil – greased up athletes. Did you do The Song of Achilles by Madeline Miller? Laura, Thank you for your reply. I make no apology for the work that the MBC has given you 🙂 Oh, and I shall pass your clarification onto ‘Peucestas’! Kizzycat, I am not sure I understand your olive oil reference. Perhaps you could clarify? Sheri, I’m glad you enjoyed it! Caroline, Please feel free to mention your novel’s name. Lattes? This page is dedicated to Alexander. It’s wine or nothing here. Apologies for posting twice – I wasn’t logged in. perhaps you could delete one? I was referring to Seleucus’ comment about Aegisthus’ oily smile. The Myceneans certainly had oil – olive oil and fish oil at least – but not petroleum oil. Olive oil was used for lamp lighting, cooking and for annointing the body, especially the bodies of athletes. So, the expression could refer to a greasy smile. However, I think it refers to the use of Macassar oil on the hair and moustaches of gentlemen in the 19th century and its association with flash young men and music-hall villians. This oil gave rise to the use of anti-macassars – those lace-fringed oblongs of white linen on the backs of armchairs and sofas. Therefore, Seleucus is probably right and ‘oily smile’ is an anatopism. Mystique. It’s soon to be released and I’m looking to get it noticed. Also Mycenaean culture, featuring the Atreides, but from Klytemnestra’s perspective! Kizzykat, Not a problem – I’ve deleted one. Thank you for the clarification; I understand you now. Your answer makes perfect sense. I shall pass the information on.